Background: Rosmarinic acid (RA) is a phenolic acid with antioxidant and anti-viral effects. We have studied anti-herpes simplex virus type 1 (HSV-1) effect of three medicinal plants from Lamiaceae family which have been standardized on the basis of RA content. Materials and Methods: Methanolic extract of Teucrium polium, Ziziphora clinopoides, and Salvia rhytidea was prepared by maceration method and RA content of the plants was determined using a spectrophotometric method. 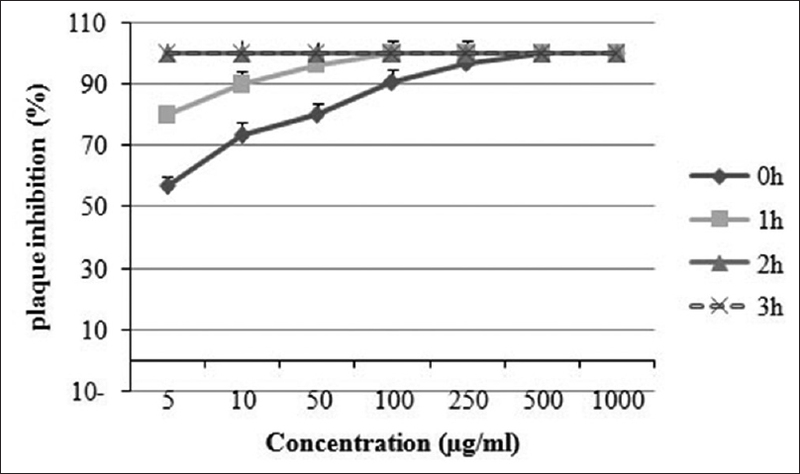 Maximum nontoxic concentration (MNTC) of the extracts was determined using neutral red method. Serial dilutions of extracts up to MNTC were examined on Vero cells for anti-HSV-1 effect by plaque assay in comparison to acyclovir as a positive control. Results: Among the tested extracts, T. polium contained the highest percentage of RA (1.8%w/w) and exhibited the least toxicity (MNTC = 1000 μg/ml). The greatest anti-HSV-1 was shown by T. polium and Z. clinopoides extracts which exhibited both time and concentration-dependent plaque inhibition. Conclusion: Considering the low toxicity and significant anti-viral effect of T. polium extract, this plant would prove valuable as an active anti-viral drug. In the present study, methanolic extracts of three medicinal plants of Teucrium polium L., Ziziphora clinopoides Lam. and Salvia rhytidea Benth from Lamiaceae family were subjected to anti-HSV-1 effect and their RA content was determined by spectrophotometric method. These plants have been widely used in treating the common cold and especially for respiratory diseases in folk medicine. Anti-herpetic effect of several species of Salvia has been studied previously. This genus is widely used in Ayurveda and other traditional systems of medicine for different purposes. Furthermore, in a study conducted on humans, a combination of sage leaf with the other plant extracts was found to reduce skin side effects associated with herpes. Pretreatment of host cells with ethanolic extracts of S. officinalis prior to virus infection revealed a strong reduction of HSV-2 plaque formation. Recently, anti-viral effects of Zataria multiflora and Zhumeria majdaei have been also studied. , To the best of our knowledge and according to a survey of the literature, there is no report on the anti-HSV-1 effect of T. polium, Z. clinopoides and S. rhytidea in the literature and it is for the 1 st time that anti-herpetic effect of a standard extract of these plants has been studied. The plants were collected from different regions of Kerman province, Iran in July, 2011. For future reference, a voucher specimen of the plants was deposited at Herbarium Center of Faculty of Pharmacy, Kerman, Iran. Characteristics of the plants are given in [Table 1]. Medicinal parts (commonly used parts of each plant in phytotherapy) of the plants were separately extracted by maceration method using methanol (80%) for 72 h. At first, about 100 g of the each plant was macerated with enough methanol 80% (about 300 ml). After 24 h, the extract was removed using Whatman filter paper No. 1 (Whatman Ltd., England) and the same volume of solvent was added to marc again and macerated for another 24 h. This process was repeated for 72 h, and the whole filtrates were mixed completely and were concentrated under vacuum and finally dried in an oven at 40°C. The dried extracts were stored at −20°C for further experiments. Standard RA was prepared from Fluka. Dulbecco's modified Eagle's medium (DMEM), fetal calf serum (FCS), penicillin, and streptomycin were purchased from Sigma. Neutral red and the other compounds were prepared from Merck, and acyclovir was prepared from Farabi Co., Iran. Simple and derivative spectrophotometric method for determination of RA in simple solutions and solutions prepared from the extracts were developed and validated. For this, 10 mg of standard RA was accurately weighed and dissolved in methanol (80%) in a 100 ml calibration flask to give a 100 μg/ml stock solution. Serial dilutions were prepared from stock solution and absorbance spectra of the RA were recorded in a wavelength range between 200 and 400 nm using a ultraviolet (UV) - visible spectrophotometer (Lambda 25, Perkin Elmer, USA). At 955max of 328 nm, absorbance of different dilutions (2, 5, 10, 15, and 20 μg/ml) of RA was measured. The calibration curve of standard solutions was constructed by plotting RA concentration versus absorbance at 328 nm. The experiment was repeated 3 times on different days, and the mean of the absorbances was used to draw a suitable standard curve. Percent of relative standard deviation% and error were calculated as a measure of precision and accuracy of the method, respectively. In addition, a third derivative spectrophotometric (Δ955 =5 nm) method using amplitude of standard solutions at 955 =349.9 nm was used to construct a calibration curve for determining RA in the extracts. This method was used to help avoid interferences of the accompanying constituents present in the extracts. As far as we know, there is no report regarding the determination of RA in the extract by derivative spectrophotometry to resolve the main peak from interfering peaks. A stock solution of each extract was prepared by dissolving 100 mg of each completely dried extract in 100 ml methanol and then filtered using Whatman filter paper No. 1. The volume of 10 ml of each sample was diluted to 100 ml using methanol, UV spectrum was recorded, third derivative spectrum at Δ955 =5 nm was calculated by UV-Winlab software and the amplitude was measured at 349.9 nm. RA content of the extracts was estimated using the calibration curve equation and amplitude of each extract preparation at 349.9 nm. Each experiment was repeated 3 times, and the results were reported as mean ± standard deviation. The research center of virology (Tehran University of Medical Sciences) prepared the strain of HSV-1 st rain KOS which was isolated from the infected cells and stored at −80°C. Infectivity titers were determined by monoclonal antibodies. Determination of TCID 50 (concentration of virus suspension which infects 50% of cells) was used for virus titration. Neutral red method was used for evaluating cytotoxicity of the extracts. Neutral red is a dye for staining living cells. Viable cells will take up the dye and incorporate it into the lysosomes. Uptake and accumulation of neutral red have a linear correlation with the number of viable cells. The cells were seeded into 24-well plates. The medium was removed after 24 h of incubation at 37°C and then 100 ml of fresh DMEM containing different dilutions of the sterile extracts (5, 10, 50, 100, 250, 500, 1000, and 1250 μg/ml were added and incubated again. After 48 h, the extracts were aspirated, and 0.2 ml of the neutral red solution (40 μg/ml) was added to wells and incubated for 1 h at 37°C. After removing the neutral red, rinsing with 0.5 ml acetic acid buffer and shaking for 15 min, absorbance was measured at 550 nm. The control wells contained extract free medium. Mean absorbance of the cell control wells was assigned 100% viability. Maximum nontoxic concentration (MNTC) of the plants was determined as the concentration of a plant which had no toxicity on viable cell number (100% viability). Potency of the tested plants for anti-HSV-1 effect was evaluated by plaque inhibition assay. Briefly, cell monolayers were infected with HSV-1 (2 × 10 5 PFU/cell) and incubated at room temperature. The plant extracts were added to wells in different dilutions (at least 5 dilutions less than MNTC). After 48 h of incubation at 37°C, the medium was aspirated and rinsed with sterile phosphate buffer saline (PBS). Then, 500 μl of methanol was added to each well and after 15 min, was re-aspirated and rinsed with PBS and fixed with formalin (10% v/v). The microwells were stained with 200 μl of crystal violet (1%) and were re-rinsed with PBS after 30-45 min. Subsequently, the plates were observed under microscope for plaque counting. In all the experiments, untreated virus-infected cells were used as control. Percent of plaque reduction was calculated relative to the amount of plaque formation in the absence of the tested compounds (the extracts were dissolved in a medium). In order to study a possible time-dependent anti-viral effect, culture media in different wells containing cell monolayers were replaced with plant extracts just after viral infection (h 0 ), 1 h (h 1 ), 2 h (h 2 ), and 3 h (h 3 ) after viral infection. After 72 h of incubation of the monolayer at 37°C and fixation by formalin (10% v/v), the cells were stained with crystal violet (1%) and the plaques were counted. Acyclovir was used as a positive control. These experiments were repeated 3 times on various days and the untreated virus-infected cells as well as medium treated viruses were used as control. Characteristics of the tested plants are given in [Table 1]. The highest percentage of extraction yields was with T. polium (30.1% g extract/100 g dried plant). The results indicated that all the three tested plants contained considerable percentage (1.4-1.8%) of RA. Among the analyzed plants, the highest percentage of RA (1.8%) was found in T. polium [Table 1]. For determining MNTC of plant extracts for anti-viral evaluation, each sterile extract was dissolved in a medium and added to wells in different dilutions. In neutral red method, MNTC was determined as the maximum concentration, the absorbance of which was equal to the control (100% viability). As shown in [Table 1], the highest toxicity was shown by S. rhytidea (MNTC = 100 μg/ml). Z. clinopoides and T. polium exhibited least toxicity (MNTC = 250 and 1000 μg/ml, respectively) [Table 1]. MNTC value for acyclovir was 500 μg/ml. The viruses were treated with plant extracts in different dilutions up to MNTC. The present results showed that all these three tested plants could inhibit plaque formation by HSV-1 in a concentration-dependent manner. The results are presented as the percentage of plaque inhibition as mean values from three independent experiments. 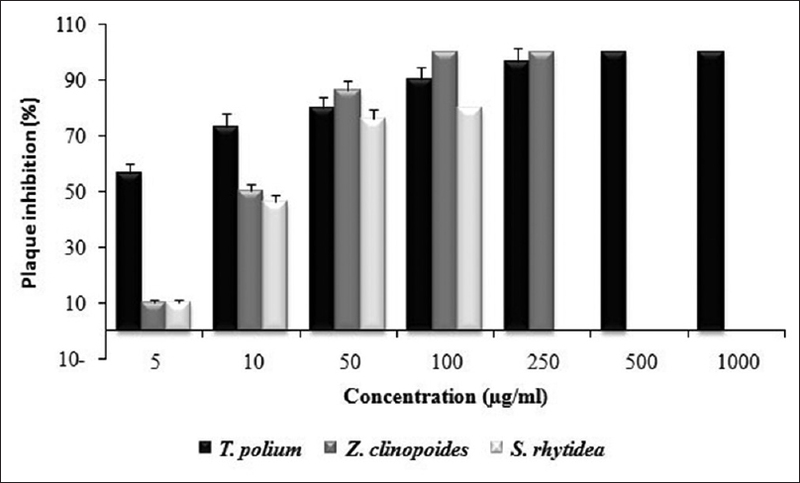 T. polium extract exhibited 100% plaque inhibition at concentration of 500 μg/ml up to MNTC while the inhibition shown by Z. clinopoides extract was 100% at 100 and 250 μg/ml [Figure 1]. Acyclovir exhibited 100% plaque inhibition at 100, 250, and 500 μg/ml (MNTC) and 96.7% inhibition at 50 μg/ml (data not shown). Extracts of T. polium and Z. clinopoides could completely inhibit plaque formation at MNTC after a period of 1 h, 2 h, and 3 h after cell infection. A clearly time-dependent activity was exhibited after different periods of cell infection. Extract of T. polium could completely inhibit plaque formation at period of 2 and 3 h after cell infection at concentrations of 50 μg/ml up to MNTC [Figure 2]. 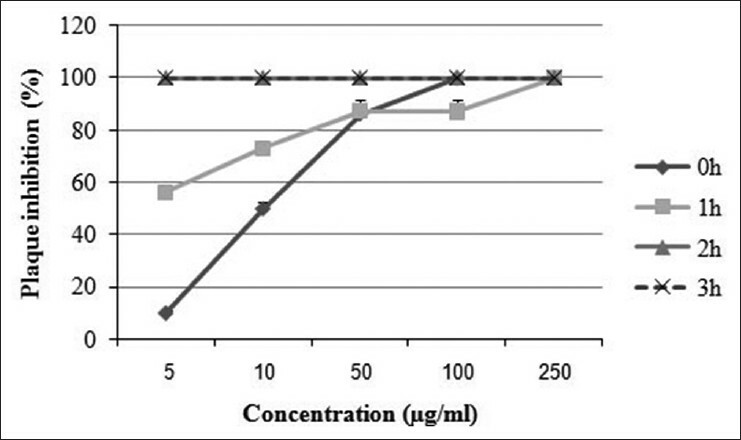 This extract exhibited 93.1% inhibition at 50 μg/ml 1 h after cell infection while 100% inhibition was shown at 100 and 250 μg/ml after 1 h of incubation. Extract of Z. clinopoides was active at all the tested concentrations (5, 10, 50, 100, and 250 μg/ml) 1 and 2 h after infection and exhibited 100% inhibition at concentrations of 100 and 250 μg/ml 1 h after infection [Figure 3]. The inhibition shown by S. rhytidea extract was at the greatest level 3 h after cell infection. This plant exhibited 80.3% inhibition at MNTC at different times after infection (data not shown). A 100% plaque inhibition occurred at concentrations of 500 and 1000 μg/ml of T. polium extract while 96.9% and 90.0% inhibition were induced at concentrations of 250 and 100 μg/ml, respectively. T. polium also completely reduced plaque formation at period of 1 h, 2 h, and 3 h after cell infection at 50 μg/ml up to MNTC [Figure 2]. Extract of Z. clinopoides exhibited 100% inhibition at concentrations of 100 and 250 μg/ml and 86.4% inhibition at 50 μg/ml. Clear concentration and time-dependent inhibition could be demonstrated by these two plant extracts [Figure 1], [Figure 2] and [Figure 3]. Extract of S. rhytidea exhibited the least anti-HSV-1 effect. The highest activity of the plant was revealed after 3 h of incubation. In all the tests, a parallel experiment was performed with acyclovir to ensure the correction route of the assay. It is for the 1 st time that these plants were studied in terms of anti-viral effect. All the three tested plant extracts used in the present work exhibited an inhibitory effect against HSV-1. Further studies of identifying the accurate mechanism are being performed. Schnitzler P, Nolkemper S, Stintzing FC, Reichling J. Comparative in vitro study on the anti-herpetic effect of phytochemically characterized aqueous and ethanolic extracts of Salvia officinalis grown at two different locations. Phytomedicine 2008;15:62-70. Schuhmacher A, Reichling J, Schnitzler P. Virucidal effect of peppermint oil on the enveloped viruses herpes simplex virus type 1 and type 2 in vitro. Phytomedicine 2003;10:504-10. De Logu A, Loy G, Pellerano ML, Bonsignore L, Schivo ML. Inactivation of HSV-1 and HSV-2 and prevention of cell-to-cell virus spread by Santolina insularis essential oil. Antiviral Res 2000;48:177-85. Reichling J. Plant-microbe interaction and secondary metabolites with antiviral, antibacterial and antifungal properties. In: Wink M, editor. Functions of Plant Secondary Metabolites and their Exploitation in Biotechnology. Sheffield: Sheffield Academic Press; 1999. Swarup V, Ghosh J, Ghosh S, Saxena A, Basu A. Antiviral and anti-inflammatory effects of rosmarinic acid in an experimental murine model of Japanese encephalitis. Antimicrob Agents Chemother 2007;51:3367-70. Sanbongi C, Takano H, Osakabe N, Sasa N, Natsume M, Yanagisawa R, et al. Rosmarinic acid in perilla extract inhibits allergic inflammation induced by mite allergen, in a mouse model. Clin Exp Allergy 2004;34:971-7. Lee J, Kim YS, Park D. Rosmarinic acid induces melanogenesis through protein kinase A activation signaling. Biochem Pharmacol 2007;74:960-8. Osakabe N, Yasuda A, Natsume M, Yoshikawa T. Rosmarinic acid inhibits epidermal inflammatory responses: Anticarcinogenic effect of Perilla frutescens extract in the murine two-stage skin model. Carcinogenesis 2004;25:549-57. Zargari A. Medicinal Plants. Tehran: Tehran University Press; 1990. Sharififar F, Dehghan-Nudeh G, Mirtajaldini M. Major flavonoids with antioxidant activity from Teucrium polium L. Food Chem 2009;112:885-8. Rasekh HR, Khoshnood-Mansourkhani MJ, Kamalinejad M. Hypolipidemic effects of Teucrium polium in rats. Fitoterapia 2001;72:937-9. Esmaeili MA, Yazdanparast R. Hypoglycaemic effect of Teucrium polium: Studies with rat pancreatic islets. J Ethnopharmacol 2004;95:27-30. Kaur R, Kapoor K, Kaur H. Plants as a source of anticancer agents. J Nat Prod Plant Resour 2011;1:119-24. Dhiman A, Nanda A, Ahmad S. A recent update in research on the antihepatotoxic potential of medicinal plants. Zhong Xi Yi Jie He Xue Bao 2012;10:117-27. Ghafari H, Yasa N, Mohammadirad A, Dehghan G, Zamani MJ, Nikfar S, et al. Protection by Ziziphora clinopoides of acetic acid-induced toxic bowel inflammation through reduction of cellular lipid peroxidation and myeloperoxidase activity. Hum Exp Toxicol 2006;25:325-32. Tian S, Shi Y, Zhou X, Ge L, Upur H. Total polyphenolic (flavonoids) content and antioxidant capacity of different Ziziphora clinopodioides Lam. extracts. Pharmacogn Mag 2011;7:65-8. Panda H. Handbook on Ayurvedic Medicines With Formulae, Processes and their Uses. Delhi: National Institue of Industrial Research; 2002. Rabah B, Lograda T, Ramdani M, Chalard P, Feguiredo G. Chemical composition and antibacterial activity of essential oil of Ziziphora hispanica L. Glob J Res Med Plants Indig Med 2013;2:73-80. Gholamhosseinian A, Fallah H, Sharififar F, Mirtajaddini M. The inhibitory effect of some Iranian plant extracts on the alpha glucosidase. Iran J Basic Med Sci 2008;11:1-9. Lin TH, Hsieh CL. Pharmacological effects of Salvia miltiorrhiza (Danshen) on cerebral infarction. Chin Med 2010;5:22. Saller R, Büechi S, Meyrat R, Schmidhauser C. Combined herbal preparation for topical treatment of Herpes labialis. Forsch Komplementarmed Klass Naturheilkd 2001;8:373-82. Arabzadeh A, Ansari M, Sharififar F. Study of antiviral effect of the essential oil of Zataria multiflora Boiss. on Herpes simplex type 1 in vero cell culture. Pak J Biol Sci 2013 2013;16:180-4. Ansari M, Sharififar F, Arabzadeh A, Shakibaie M, Heidarbeigi M. Inhibitory effect of a standard extract of Zhumeria majdae Rech.f. and Wendelbo. against Herpes simplex-1 virus. J Med Sci 2013;8:755-60. Reichling J, Koch C, Stahl-Biskup E, Sojka C, Schnitzler P. Virucidal activity of a beta-triketone-rich essential oil of Leptospermum scoparium (manuka oil) against HSV-1 and HSV-2 in cell culture. Planta Med 2005;71:1123-7. Söderberg TA, Johansson A, Gref R. Toxic effects of some conifer resin acids and tea tree oil on human epithelial and fibroblast cells. Toxicology 1996;107:99-109. Koch C, Reichling J, Schneele J, Schnitzler P. Inhibitory effect of essential oils against herpes simplex virus type 2. Phytomedicine 2008;15:71-8. Nolkemper S, Reichling J, Stintzing FC, Carle R, Schnitzler P. Antiviral effect of aqueous extracts from species of the Lamiaceae family against Herpes simplex virus type 1 and type 2 in vitro. Planta Med 2006;72:1378-82. Shekarchi M, Hajimehdipoor H, Saeidnia S, Gohari AR, Hamedani MP. Comparative study of rosmarinic acid content in some plants of Labiatae family. Pharmacogn Mag 2012;8:37-41. Achamlale S, Rezzonico B, Grignon-Dubois M. Rosmarinic acid from beach waste: Isolation and HPLC quantification in Zostera detritus from Arcachon lagoon. Food Chem 2009;113:878-83. Cohen RA, Kucera LS, Herrmann EC Jr. Antiviral activity of melissa officinalis (Lemon balm) extracT. Proc Soc Exp Biol Med 1964;117:431-4. Kucera LS, Herrmann EC Jr. Antiviral substances in plants of the mint family (Labiatae). I. Tannin of Melissa officinalis. Proc Soc Exp Biol Med 1967;124:865-9. May G, Willuhn G. Antiviral effect of aqueous plant extracts in tissue culture. Drug Res 1978;28:1-7. Reichling J. Plant-microbe interaction and secondary metabolites with antiviral, antibacterial and antifungal properties. In: Wink M, editor. Functions of Plant Secondary Metabolites and their Exploitation in Biotechnology. Vol. 3. Willey-Blackwell Pub; 1999. p. 187-273. Jassim SA, Naji MA. Novel antiviral agents: A medicinal plant perspective. J Appl Microbiol 2003;95:412-27.